One Direction will be among the headline acts at the Apple Music Festival at London's Roundhouse. The British boyband - composed of Niall Horan, Liam Payne, Harry Styles and Louis Tomlinson - will be one of the star attractions at the event formerly known as the iTunes Festival, which is set to take place from September 19th until September 28th. Looking forward to the festival, Niall said: "It'll be great to be back in London and we can't wait to perform for our fans in the Roundhouse and around the world on Apple Music!" Other acts scheduled to perform at the star-studded festival include Florence + The Machine, Disclosure and Pharrell Williams, who has revealed his excitement at the prospect of performing in London once more. He said: "Wow, I'm so grateful to be performing at the Apple Music Festival. The Roundhouse is such a historic music venue ... there's always a special energy in the crowd." Miley Cyrus is putting the ''finishing touches'' to her new music. Jazz Summers, who managed some of Britain’s most successful bands including Wham!, Snow Patrol and The Verve, has died, his spokesman has confirmed. The Spice Girls recently got together ahead of their reunion. Zayn Malik appears to have thrown some serious shade at Little Mix via twitter. Jennifer Lopez's Las Vegas residency will be ''glamorous and beautiful''. Pop star Amy Winehouse thought she was pregnant before she died, her father has said. 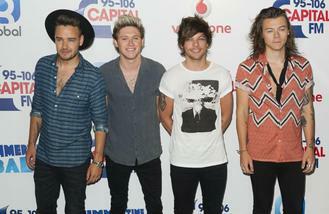 One Direction proved they are still top pick as a four-piece as they won eight gongs at the Teen Choice Awards. Iron Maiden fans couldn’t contain their excitement, after the heavy metal band released their new track, Speed Of Light.